The FIA Court of Appeal has rejected the Red Bull Formula 1 team's appeal against Daniel Ricciardo's disqualification from the Australian Grand Prix. The Australian's car was found to have "consistently" exceeded the maximum permitted fuel-flow rate of 100kg/h but despite Red Bull arguing during Monday's hearing that this was not the case, the exclusion stands. A five-man judging panel comprising Harry Duijm, Rui Botica Santos, Philippe Narmino, Antonio Rigozzi and Jan Stovicek made the decision based on yesterday's six-hour hearing in the FIA's Paris headquarters and extensive written testimony. "The Court, after having heard the parties and examined their submissions, decided to uphold the Decision #56 of the Stewards by which they decided to exclude Infiniti Red Bull Racing's car #3 from the results of the 2014 Australian Grand Prix," said an FIA statement. The full decision will be released "by the end of the week" although it's clear that the judges did not accept the basis of Red Bull's argument. The team contended that its own fuel rail data was more accurate than a problematic fuel-flow sensor, permitting it to switch to its own fuel-flow model. Whether or not technical directive TD/016-14, issued on March 1, which made provision for relying on a team's own fuel flow model only with the FIA's permission and an FIA-issued correction factor, was binding was central to Red Bull's case. 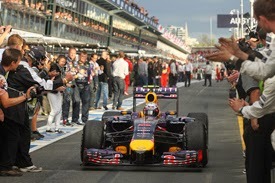 It argued that the sensor, which offered different readings with identical engine settings during the first three runs in free practice three and the rest of Friday in Australia, was unreliable and therefore it could switch to the backup based on that without the FIA's say-so, contrary to what the technical directive said. Red Bull had built its case on not having violated Article 5.1.4 of the technical regulations, which states "fuel mass flow must not exceed 100kg/h", but the FIA contended that it was only through the procedures laid out in the technical directives and therefore the fuel-flow meter that it was possible to prove compliance with that regulation. While the team did offer evidence supporting the accuracy of its own fuel-flow model, any such data was argued by the FIA not to be verifiable as it still relies partly upon a software model. The court of appeal has not issued any further sanction despite Mercedes representative Paul Harris QC arguing forcefully for a suspended punishment to ensure Red Bull was not tempted to repeat its offence. As Red Bull made no attempt to hide what it had done given the FIA has access to comprehensive live fuel-flow data during the race, it's likely that this is seen unnecessary as there was no duplicity involved. Crucially, this decision validates the use of the Gill Sensors-produced fuel-flow meter to police both the fuel-flow rate and the 100kg-per-race fuel limit, and confirms that only the FIA has the right to allow teams to switch to their own fuel-flow model as laid out in the technical directive.